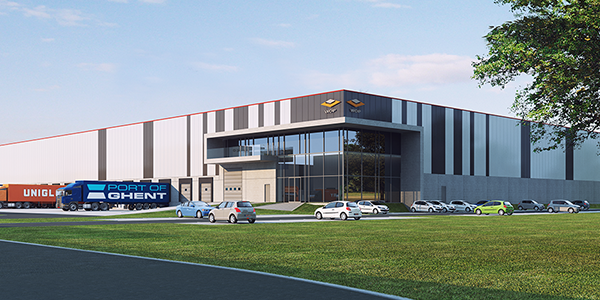 The four characteristics of a "Warehouse of the Future"
WDP is specialised in the design of modern, customised warehouses. When we work with you to draw up a new warehouse, we always look for the best outcome in terms of personalisation and cost efficiency. As a customer, you require a warehouse that is fully tailored to all your needs, both in terms of sustainability, regulations and new technology. But as usual, personalisation such as this comes with a price tag. Furthermore, WDP must also ensure that the property can be re-rented if the lease is not renewed. Just like building a private home, there are a number of regulations in terms of insulation and energy supply that you must adhere to for the development of a new warehouse. The warehouses built by WDP fully meet this environmental criteria standard. In many more cases we go a lot further to achieve even better energy efficiency. This means you can be assured that you will not have to invest in various sustainability measures in a few years. One of the best examples of this is the building that WDP recently delivered for e-retailer, Wehkamp. This warehouse is what is commonly known as a "hybrid warehouse". One part of the magazine will be reserved for a fully automated picking system, while the other part is used for traditional picking using forklift trucks. Despite the advanced automation and modern infrastructure, this warehouse received an "excellent" score from BREEAM, a standard for sustainable development and commissioning of real estate. This is no surprise. WDP has ensured that Wehkamp leaves a very small carbon footprint with this warehouse. For this, we installed one of the largest solar panel roofs in the Netherlands on the warehouse, which provides as much as 40% of Wehkamp's power requirements. It provides 2,500 megawatt hours of electricity per year. This is equivalent to the annual consumption of seven hundred Dutch families. A warehouse for the future must be able to cope with (unexpected) future situations. Suppose a lease is not extended for whatever reason, WDP must be able to rent property to another tenant as quickly as possible. In practice, this has an influence on the rental term. The more we provide a tailored solution, the longer the rental period will be in practice. This means we try to help our customers with their needs, but also manage the risk for ourselves. Warehouses that are designed with greater flexibility in mind and not exclusively for a specific purpose can be rented for shorter periods or more flexibly. With the current advances in technology and consumer demand, it is also almost impossible to know where you will stand as a company in 10 or even 5 years. Therefore, it is often wise to organise (part of) your warehouse flexibly so that you can diversify your product range should the need arise. There are many 3PL players (such as DHL and Kuehne & Nagel) depending on contracts that they will enter into with their clients. Does an e-commerce customer stop after a 3-year lease? As a 3PL, you need to be able to fill the vacant space as quickly as possible. You will then benefit from having a distribution centre that is also suitable for the storage of many different kinds of products. With each real estate investment, location is one of the most important considerations, and this is also true for a warehouse or distribution centre. A logistics hotspot is often where major European roads come together, or places where multi-modal transport by rail, air, sea and inland waterway is possible. This means you are not only able to quickly deliver your products to customers, but it is often cheaper and more environmentally friendly. The transport of goods by inland waterway for instance is not only more sustainable than transport by truck, but it is less risky and in some cases cheaper. A "Warehouse of the Future" can also lie closer to the centre of a town. In the past, cities were ports or logistics hubs, and as a result, there were often warehouses situated right in the centre. Over the years, depots were moved out of the city and consolidated in logistic hotspots. However, with the current shift towards faster delivery times, we are seeing a shift back to the "old model". This means retailers are choosing to build distribution centres on the outskirts of the city and using bicycle couriers (or in the future, maybe even drones) to deliver the parcels. Amazon has gone one step further and opened a warehouse on 5th Avenue in down town New York, guaranteeing "one-hour delivery". Currently, this super-fast delivery of parcels is reserved for VIP customers, but in the future this will increasingly become the norm. Of course, technological innovation and automation cannot be forgotten as the fourth and perhaps most important feature of a warehouse of the future. Drone-delivery, self-propelled trucks, and 3-D printing are just a few new technologies that will dramatically change the global logistics market. But new trends are not only being seen outside the logistics building. The shape and structure of warehouses was thoroughly designed for automation and the most efficient possible use of the available surface. For example, WDP built a "dark warehouse" for international industrial bakery, Lantmännen Unibake. This is a warehouse where picking is fully automated with cranes, which means there is no human labour involved at all. Possibly the most unique feature of this property is that the load-bearing structure of the building is actually the 32-metre high shelving racks. Practically every cubic metre of this warehouse can then be used for the storage of goods.